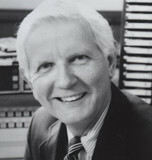 Gordon Hinkley was a 51-year veteran radio and TV personality, spending 42 years at WTMJ-AM, Milwaukee. Hinkley first took to the airwaves in 1941 while still in high school in Wisconsin Rapids with his own weekly piano show on WFHR-AM. He continued his career on Armed Forces Radio while in military service and then served as a morning show host on WSAU-AM, Wausau, in the year prior to his move to WTMJ in 1950. In the mid 1950’s, he served as a radio staff announcer and hosted a live musical variety show and a nightly interview show on WTMJ-TV. In 1961, Hinkley began a 23- year run as host of “Top O’ The Morning”, one of Milwaukee’s most widely listened to wake-up shows. He hosted “Ask Your Neighbor”, a daily call-in show he began in 1961, as well as one of the longest running shows in Wisconsin radio history, “Invitation to Beauty”, a weekly program of light classics and popular music on Sunday mornings he put on the air in 1951. He has been honored for his community service contributions by such groups as the Salvation Army, Make A Wish Foundation, The Medical Society of Wisconsin, Broadcast Pioneers and Badger Chapter of American Women in Radio and Television. In 1988, the Milwaukee School of Engineering conferred upon Hinkley the honorary degree of Doctor of Humane Letters. Gordon Hinkley passed away on December 23, 2013.